COLORADO, U.S.A. – Jan 22, 2019 –Nationwide Auto Transportation, a Colorado-based company that specializes in vehicle shipping, shipped in excess of 25,000 vehicles in 2018, and will celebrate this incredible milestone by giving shipping one car free car shipping service on behalf of one of their Facebook followers by the end of next month. In the past year, the company has invested heavily in technology to make their website one of the most comprehensive and authoritative sources on auto shipping. Their goal is to grow their completed auto shipments from 25,000 in 2018 to 40,000 this year. 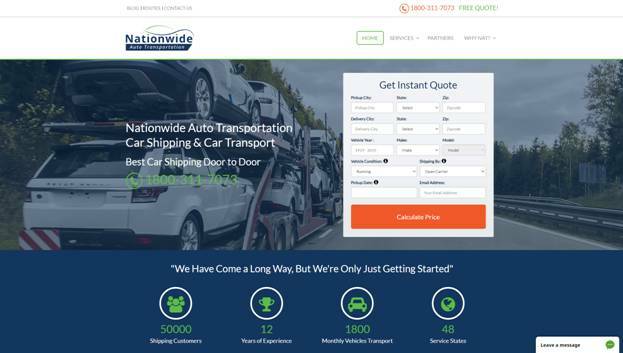 In keeping with their desire to shake up the industry and provide a one-stop service for customers, Nationwide Auto Transportation has also revealed that they will be the first company to launch a motorcycle shipping calculator on their website this year. The company already owns a proprietary car shipping calculator which gathers important data points that affect the cost of auto shipping and uses a sophisticated algorithm to calculate an instant quote based on the user’s inputs. The motorcycle shipping calculator will use a similar technology, but with data points that are specific to motorcycles. A further website enhancement, which will make the website even more effective for visitors, will be the launch of a chatbot. The company is in the process of launching their new chatbot which provides answers on industry-related questions to help consumers make informed decisions about auto shipping. We believe that by informing potential clients of their many options will help them realize that we are an authority in the industry, and that will be one of the many reasons why they will choose us to ship their cars. The owners of Nationwide Auto Transportation believe that these standards are what have helped them accomplish their recent milestones, and maintaining those standards while providing more advanced technology will help them attain their goal of 40,000 shipments for 2019. If you wish to be in line to win the free car shipping service, please follow Nationwide Auto Transportation on Facebook and follow the instructions. Nationwide Auto Transportation is a Colorado-based vehicle shipping company that provides professional car, SUV, motorcycle, truck and RV shipping services to individuals, military personnel, auto dealers, collectors and motoring clubs across the US. Founded in 2002, the company offers a range of flexible auto transportation services at competitive rates. With a vast network of experienced drivers, the company has an unmatched record of successful deliveries. Our sophisticated online car shipping quote calculator uses data obtained from sources in real-time to prepare the most accurate rates to our clients. Please visit https://nationwideautotransportation.com for more information on auto shipping. Be the first to comment on "Nationwide Auto Transport Celebrates Milestone By Giving Away Free Auto Shipping"